The welcoming home is one with landscape and exterior lighting. It’s an artistic endeavor to do it well, so do your homework and talk with the experts at Madison Lighting. In our Madison, Wisconsin showroom you can explore the exterior light lab. You’ll discover how shadow is as interesting as light; that too much light creates hotspots while not enough light flattens out the façade. Highlight paths, shrubs and trees away from the house to create a vignette you’ll view from inside that beckons to you all 4 seasons. Kichler is just one manufacturer that makes stylish and durable exterior and landscape lighting. Layering light is just as important outside as it is inside your home. Consider moonlighting: small spotlights hung 15-18 feet from the ground in major trees. These spots shine downward creating a gentle source of ambient light. In Madison’s climate it’s important to see icy sidewalks, but think of children’s toys, garden tools, all manner of things to trip over that can come to rest on the walk to your front or back door. Safety is important, too. And a well lit home is less welcoming to a burglar! Mid-level lighting is often used to create effects outside. Washing a wall is one technique, as small spotlights shine up and bounce light off an exterior wall. Wall washing highlights the architecture, brick or stone of your home and looks beautiful from the street. Another form of mid-level lighting is using spotlights to accent a small tree or piece of art in your garden. Using 3 or more spots placed away from the base of the plant makes it 3 dimensional and interesting. And viewing this vignette from the inside your home is equally charming. Mid-level exterior lighting is a wonderful source of decorative and useful light. Lower-level lighting actually guides the foot on a pathway. This is lighting that can be attached to a metal stem, attached to the edge of steps, tucked along side large rocks in a landscape planting, and it points down toward the path. But, be careful. Too much of this can make your home look like an airport runway. Exterior lights on the house give the visitor visual cues to find the front door, the garage door, and the gate to your garden where the party is already in full swing. Quality exterior lighting is made to handle our cold temps, wind, hail, and the occasional errant baseball. It’s pretty durable, though not indestructible. 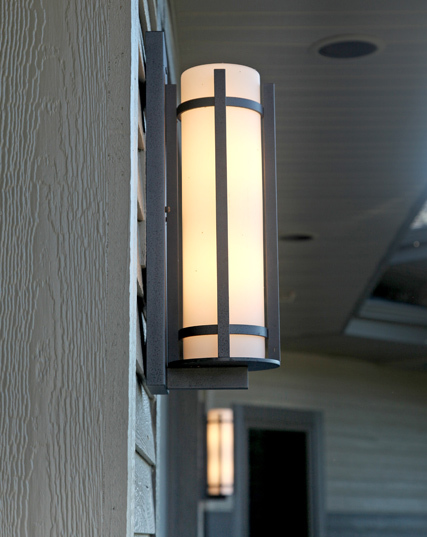 Exterior lighting comes in many styles and every finish so you can find the perfect look for your home. 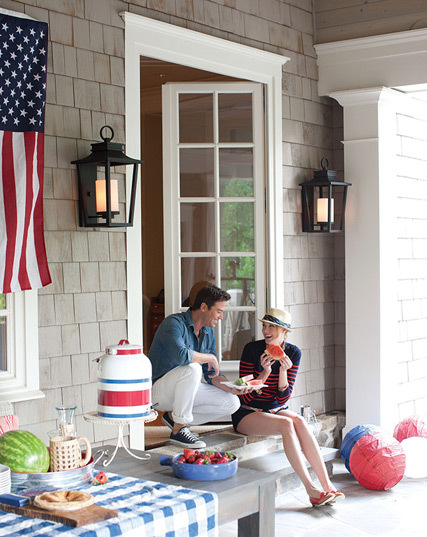 And there are lots of types: wall mounted lights for either side of the doors and post lighting for traditional lights off the driveway or front walk, flush mounts or pendants to hang from the ceiling of a covered porch, motion detection lighting is used for added safety, and lanterns light the garage door. If you choose to use compact fluorescent or LED light you can purchase fixtures that use those bulbs, and save energy that may eventually pay for the cost of the fixtures.